www.kuroganehammer.com is a website dedicated to creating frame data pages for every character in Smash Ultimate. Oh, maybe I will do Yoshi next! 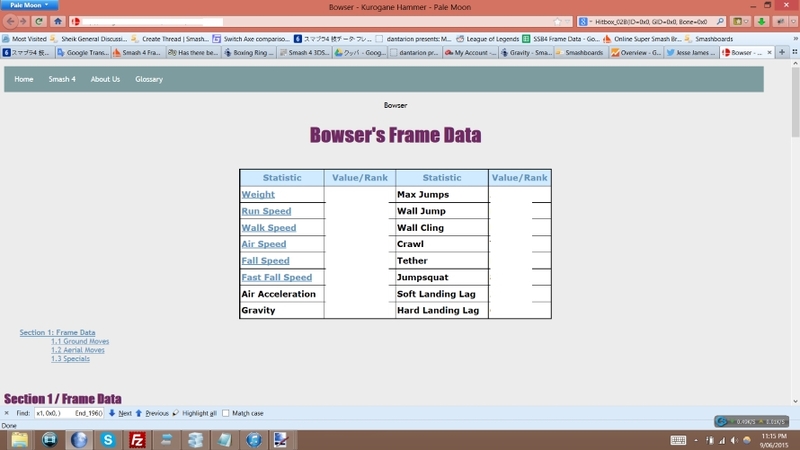 I just finished Bowser's data and hid it on my website. "It's unfinished," is the reason cited. You're all more than welcome to try to find it though! Probs will release Bowser publicly tonight. Also the next character on my list also. Data mine said Dog's fair was frame 4 and I always thought that was suspicious. Now if only that move had any auto cancel frames. I think dog would be much better if he had, like, a KO move. What's the frame data for Dreamland? Ever wanted to be Deez? Now you can! Made an account to humbly ask for Ike's info. I know he's underused, but I'd like to give him a good fighting chance. Would be forever in your debt. Ah, the stars are aligning, then. I look forward to it, your work here is pretty stellar. Who do we like? Bike? Kite? How about the man who fights for his friends and gives no sympathy? Where's the Link love?! Link Link Link!!! W00t! You are a scholar and a gentleman. What does "cannot rebound" mean for Ike's dash attack? It can't retract if it clank with another move. Can I share your Lucario frame data page on the Lucario boards? Christmas has come early - thank you based Aerodrome!